Hi there, have you done a factory reset? Mia this happening while using native apps? Or something like through kodi to access YouTube? It seems to be registering with non android tv devices to stay on. Mine shuts off when not in use. 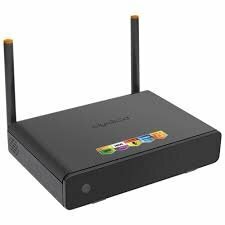 One possible solution would be to setup the hdd on your network, either through shared access on windows, or your router and view files through the network to ensure it is handling its power correctly when not used. It can can be accessed once shared on the network, through apps like kodi or Vlc. Hi there, im sorry to hear you’re having issues. If you purchased this in Canada, it should still be under our warranty coverage. Please head over to mygica.tv/help and start a ticket. Mention what you did here and let’s get this fixed for you. Hi there, ive never sent that before. What is your resolution settings in the system? You may want to try changing it to see if it makes a difference. Dlh, what do you mean hard reset the remote? The box can be hard reset through both manual and in operating system methods. Do you not have a mouse that will work? Have you tried the remote pairing procedures? DLH, it it showing in the wifi selection screen? If so, how many bars? Hi there, im sorry, but I’m having trouble understanding what you’re trying to say. Lorrie, did you try sideloading them? What method did you try? Hey guys, this is not normal. If it is only freezing during usage with a specific app, give me more details. If it is freezing like the guy above stated in the menues, and no other apps are running, you’ll want to get this checked out. Head over to mygica.tv/help and start a warranty ticket. This is sort of sounding like a hardware issue. Is the unit hot? What firmware version are are you using? Hi there, this is interesting and we’ll have to check it out. I’ll mention though, we weren’t being sneaky, the power button on the unit is the reset button. Simply hold it down while powering it up to do the same effect.